Omnisoft has a wealth of features and capabilities designed to create Omnicommerce solution. This page provides you with a quick snapshot of its features and capabilities. We have included all the necessary tools required to build a successful Omnicommerce solution. We’re always adding to the list of features, so check out or contact us to find out what’s in the pipeline. Omnisoft is the leading Omnicommerce solution, allowing people to set up an online and in-store solution quickly and easily. One key feature of the Omnisoft is its pluggable modular/layered architecture which allows additional functionality and presentation elements to be dynamically added to the application at run-time. This pluggable modularized architecture makes it easy to create and manage your Omnicommerce solution. Mobile Commerce, also known as M-Commerce or mCommerce, is the ability to conduct commerce using a mobile device, such as a mobile phone. There’s no question that mobile web use is on the rise. Recent reports tell us that cellular networks worldwide are seeing major increases in growth. It is time to make sure that you have a mobile strategy in store that’ll give you maximum exposure across all platforms. The possibilities of this sector are enormous to take things head-on and be at the cutting edge of mobile ecommerce development. OmniSoft allows you to create a mobile version of your website through an intuitive and user-friendly graphical user interface with just one click. Best of all OmniSoft Mobile is a free and available out of the box. OmniSoft Mobile works on any connected device, without requiring extra development or add-ons, regardless of device type. The application, which renders a device-aware shopping experience, delivers a compelling, feature rich and graphically pleasing storefront and provides a means for retailers to immediately deliver relevant offers, promotions and products to increase sales and drive business across all channels, no matter what device the consumers are using. The multi-store feature enables you to run more than one store from a single OmniSoft installation. This enables you to host more than one front-end store on different domains and manage all admin operations from your single Administration panel. You can share catalog data between stores, have a product in more than one store for example, and your customers can login to all of your stores using the same credentials. Multi-vendor and drop shipping support enables you to sell online without having to stock inventory or ship orders. When drop shipping is enabled, each product is assigned to a particular vendor whose details (including email address) are stored. When an order is placed an email is sent to the vendor of each product in the order. The email includes the products, quantities, etc. The vendor then ships the item to the customer on behalf of the merchant, who typically pays each of their vendors at the end of the month. Products from multiple independent vendors appear in the common product catalog and your website visitors can shop at one web store even if your products are supplied by hundreds of different vendors from all over the world. Each vendor could be provided with an administrator panel access to manage their products, review sales reports and order details regarding their products. Vendors do not interfere with each other’s activity. When a sale is made, all money will go straight to your account. Afterward, a store owner will manually distribute a payment to each vendor according to the order history. Each vendor has its own admin panel where he can manage his catalog and see placed orders. Product attributes. Create as many attributes for your products as you like, such as size and color — each with its own SKU, price, weight, image and stock level. Customer can add text options on products for customers to fill in, such as initials for monogrammed products. Customer can even upload files, such as print photo. Product comparison. Comparing products, options, and features side by side removes the guess work away from the customer, and facilitates its research, improving the time, and odds of adding the selection to cart. Stock management. Our inventory management allows store owners to discern physical stock and available quantities. 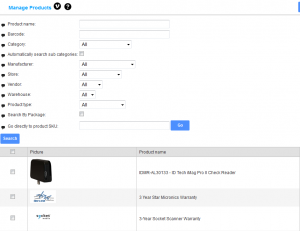 You can easily manage backorder and pre-order status for each product. Multiple warehouses supported. Partial deliveries are also supported. And stock management by product attributes (such as, color and size). Prices. Individual prices can be specified for individual customer groups. 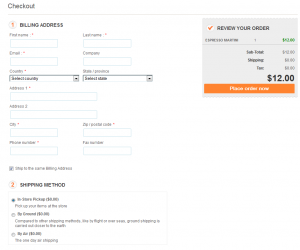 You can allow customers to enter product price (e.g. donation products). Or allow store owner to hide prices for non-registered customers. OmniSoft also supports “Sale” prices and “Call for price” options. Downloadable products. 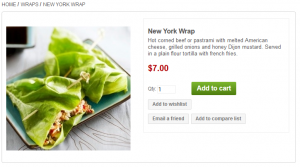 Selling downloadable products such as music files and ebooks can be a great enhancement to your online store. OmniSoft supports license attachments and user agreements for such products. A store owner can choose a download activation type: “When order payment status is Paid” or “Manual activation”. Search engine optimization (SEO) is the process of affecting the visibility of a website in search engine results. SEO helps to ensure that a site is accessible to a search engine and improves the chances that the site will be found by the search engine. Our search engine optimization gives you higher search rankings, meaning more free traffic to your store. Search engine friendly. OmniSoft combines all the features necessary to improve SEO efforts. A store owner has full access for managing of keyword tags and customized URLs. This will give your site more weight with Google when it comes to ranking your site against similar sites. Sitemap. There are two popular versions of a site map. OmniSoft supports both of them. An XML Sitemap is a structured format that a user doesn’t need to see, but it tells the search engine about the pages in a site, their relative importance to each other, and how often they are updated. HTML sitemaps are designed for the user to help them find content on the page, and don’t need to include each and every subpage. This helps visitors and search engine bots find pages on the site. Microdata. Integrating microdata into your website’s code offers a number of potential advantages. First, microdata can give the search-engine spiders more context for the type of information on a website and the way the site should be indexed and ranked. Another benefit of microdata is the creation of “rich snippets,” which display more information on the search result pages than traditional listings. OmniSoft also supports Twitter and Open Graph (Facebook) META tags. Localizable URLs. 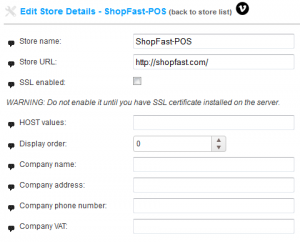 OmniSoft allow a store owner to localize URLs. URL localization increases the chances of matching search results in other cultures/languages. Breadcrumbs. Google is integrating breadcrumbs navigation within the search engine results page which actually makes your listing look more attractive and trustworthy. . Also when it comes to huge websites, breadcrumbs can be a great way to help users identify where they are located. URL Canonicalization. The canonicalization used to reduce indexing of duplicate pages and make the site more crawlable by setting a store URL to the canonical (preferred) URL for each category and product pages. Google Analytics integration. OmniSoft is integrated with Google Analytics. 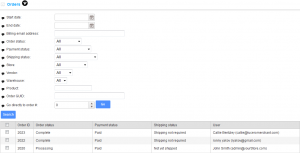 Ecommerce transaction tracking automatically connects your Google Analytics web usage data with customer transactions. Anonymous checkout. The anonymous checkout feature allows customers to check out without creating an account. Many customers prefer this as it allows them to get through checkout more quickly. Checkout attributes. At checkout you can provide customers with various options. For example, gift wrap their items or personalize with messages. One-page checkout. One-page checkout functionality dramatically reduces the steps required in the checkout process. 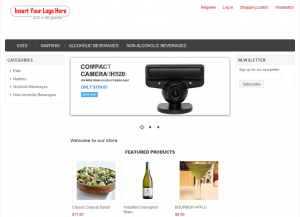 By making checkout easier for customers, you will increase your revenue and conversion rate. Reward Points System. The rewards points program allows you to offer points per dollar spent on your store. The customer can then redeem the points for additional products at your store. Import products to Facebook. Get integrated with Facebook in just a few simple steps and start selling to Facebook users today. Supports related products. Displaying related products is a wonderful tool to “up-sell” customers while they browse a product’s page or before checkout. Discounts and coupons. 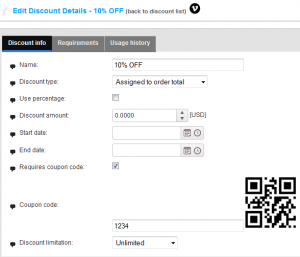 Discount amount can either be a fixed value or a percent off. e.g. $10.00 off or 20% off. You can specify a start date and an end date when the coupon is valid. Discounts can be assigned to products, entire category, shipping, or order total. Discounts can be filtered by a customer role. We also support quantity discounts (tier prices). ‘One time only’ and ‘One time per customer’ discounts. We also support various discount requirements (e.g. ‘Had purchased one of these product variants’ or ‘Spent amount’). Newsletter subscriptions. OmniSoft allows your customers to subscriber to newsletters. OmniSoft offers a tool for creating your own custom newsletters and email campaigns. It can also be integrated with third-party newsletter services (e.g. MailChimp). Content. OmniSoft supports news, blog, forums, polls, and custom pages (topics). Gift cards. Gift cards functionality is something that every merchant needs, no matter if running an online or offline business. OmniSoft supports two types of gift cards: gifts cards delivered via e-mail (Virtual) and classic gift cards to be sent via post office (Physical). Affiliate program. Affiliate marketing is a type of performance-based marketing in which a a store owner rewards one or more affiliates for each visitor or customer brought by the affiliate’s own marketing efforts. OmniSoft allows you to accept all major credit and debit cards. Every country has its own payment preference, that’s why OmniSoft allows you to limit payment methods per country. Store can be set to authorize only, or auth-capture credit card mode. You can then capture payment at shipment if desired. OmniSoft also supports refund (and partial refund) and void functionality. Calculation. 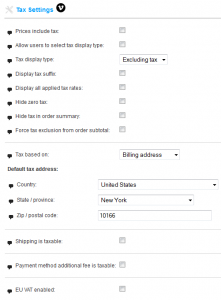 Store can be configured for free shipping over $X. A store owner can configure shipping rates based on order weight or order totals. A store owner can also specify additional shipping charges per product. A store owner can create shipping discounts (percent or fixed amount). Customer groups can be marked as free shipping. OmniSoft allows you to limit available shipping methods per country. Also we support “no shipping required” products (e.g. services). Addresses. OmniSoft also allows your customers to give two different addresses for billing and shipping, so they can easily send items as gifts. Estimate shipping. It helps customers to estimate shipping cost before the checkout process start. Customers just enter country, state and zip code information, it will show available shipping options and each estimated cost. Shipping methods. A store owner can define custom shipping methods (e.g. Ground, Next Day, 2nd Day, etc) or use popular shipping carriers (e.g. UPS, USPS, FedEx, etc). OmniSoft is integrated with major shipping carriers. Your customers can choose their preferred carrier based on experience, price, or destination. Packaging slips. Also multiple shipments per order are supported. Tracking numbers are supported, so customers can easily track where shipments are located right now. Tax calculations in OmniSoft offer a considerable amount of flexibility to meet your store’s legal requirements, your preferences, and the expectations of your customers. Store owners can manage all setting and details in admin website by easily. Customer attributes. 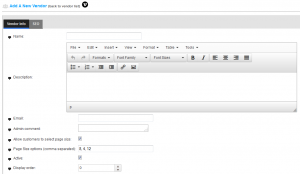 You’re allowed to enable or disable any built-in customer attribute (e.g. Country or Address fields). You can also add any other custom attribute specific for business. External authentication. 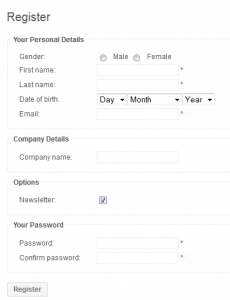 Allow your customers to register and login using such as OpenID, Facebook, Twitter, etc. Security and permissions. A store owner can configure specific rules and permissions for users. Perhaps you want to only allow some employees to edit products or view order statistics. Wishlist. Wishlist enables customers to store products for purchasing at a later time. RTL support. RTL means Right-To-Left and it’s for users who uses a different alphabet in their languages and far than that, they read & write from another direction. For example:- Hebrew, Persian, Arabic. EU cookie law. Effective from May 2012 the EU (European Union) cookie law requires websites to gain permission from users, before planting cookies.